Spend a day on the Watermark. Watermark Salmon Fishing Charters offers expert guided, world class salmon fishing excursions. Experience the best salmon fishing Vancouver has to offer on board the Watermark, excellent for both amateur and experienced fishermen alike. Join us on our 32′ Sailfish for a premier fishing experience along the beautiful coast of Vancouver, BC. 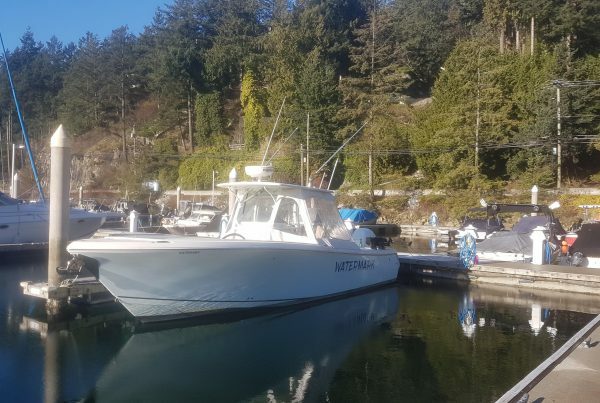 Your charter embarks from West Vancouver, a unique and coveted location, which has you in prime fishing territory within minutes. Not only will you be able to experience first-rate salmon fishing but the local area is also bountiful with dungeness crab and spot prawns when in season. Upon request we can take a side trip and check the traps! 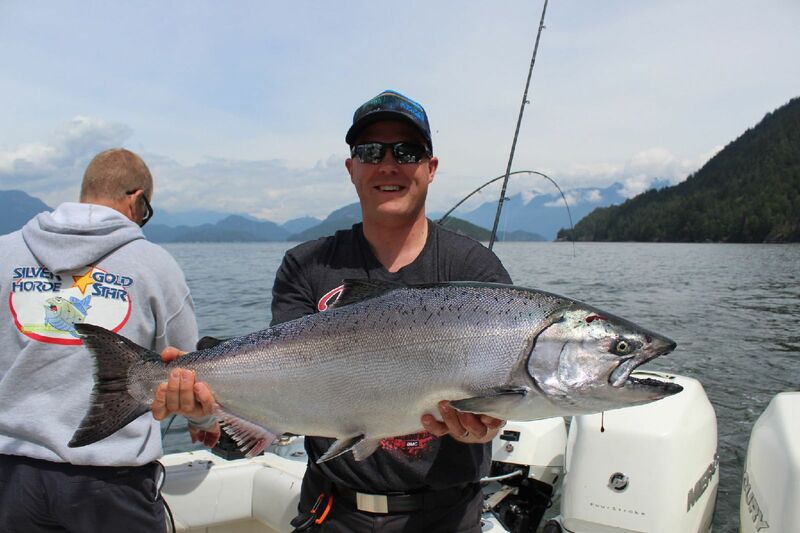 Watermark Salmon Fishing Charters is conveniently located 20 minutes from downtown Vancouver. Whether staying in the city or on the North Shore, why not enhance your holiday with a charter? It’s a great way to see Vancouver and take full advantage of everything this beautiful city has to offer. Being on the water in proximity to Vancouver and the breathtaking and unique Gulf Islands, you’ll get a perspective of the city and its surrounding locations unlike any other. taking public transit? visit the TransLink Planning website for details on how to get here. We take pride in our customer service excellence and our primary goal is to ensure you have the best time on the water you possibly can! With over 20 years’ experience, we have kept our clients coming back to charter again year after year. Local Vancouver clients and those from abroad as well! We are incredibly proud that over 80% of our customers are return guests. Check out what our customers are saying! Visit us on TripAdvisor and see why we’re your best choice for local salmon fishing. Had a great charter? Please leave us a review. Watermark Salmon Fishing Charters cater to individual fisherman and groups alike. Whether you’re looking for a half day locally or full day guided fishing tour through the Gulf Islands, let us show you Vancouver fishing at its finest. Our experienced guide is here to make sure you have a great excursion, no matter your knowledge or skill level. We invite you to join us on your own, as a fun family adventure, bachelor and bachelorette parties, or for a unique corporate getaway; we happily accommodate it all on our salmon fishing excursions! We are fortunate enough to be situated a short distance from downtown Vancouver in one of the most scenic locales in the world. Vancouver offers unparalleled salmon fishing 365 days a year, as salmon fisheries locally and in surrounding areas are active year round. For more information or to book your charter, please contact us. We look forward to hosting your excursion this year!